The weather forecast had not been good the night before, and there were several heavy showers in the early morning. However by 10: 30, bracing the constant drizzles, all the passionate, hard working, and high spirited volunteers had arrived and started getting ready for the event. As a final touch, miraculously the rain started to die down around 11:45 and gradually a nice clear sky appeared and a gentle wind started to permeate the beautiful camp. The lunch staff led by Sanglee Wong had ordered enough food with varieties to satisfy everyone’s discerning palate. The local Chinese restaurant the Pebbles even set up a small cookery on site to offer free street foods such as fried banana! Before the delicious lunch was served the YMCA staff welcomed us. This year is the second year CCC held the annual picnic at the YMCA facility and both parties were grateful for the successful cooperation so far. The event reached the climax with the raffle drawing. There were 33 lucky winners for magnificent raffle prizes offered by supporting local merchants, including many gift cards valued more than $100! It is worth mention that several local merchants and nonprofit institutions set up booths as a way of supporting this event. All together they donated $4000 towards the 2018 CCC picnic. Kudos is due to the picnic fundraising team led by Xiaoqing Zhang and Yue Lei. After the lunch and the official programs, happy adults and lively young children scattered away to various sports courts and activities and laughter filled the entire camp site. The YMCA Adventure Camp is a vast facility with abundance of greenery. It is equipped with athletic fields, basket courts, tennis courts, beach volleyball, ga-ga ball pit, playground, bounce house, rock wall, zip-line, swimming pool, paddle boats and archery range, with the play area, archery range, beach volleyball, ga-ga ball, bounce horse, rock wall and tennis courts being CCC families’ favorites. In a nutshell the Camp is a facility for all ages. To be even more inclusive our Executive Team added the Zumba Dance and a professional photo booth to take free headshots and family pictures. A team of professional photographers and videographers documented the entire event. The picnic camp ended at 5:30 and together we had a memorable, exciting and fun time spent with families, friends and new acquaintances. All of us look forward to being a part of the 2019 CCC picnic again, and we invite you to join us in 2019 if we missed you this year. The board meeting took place on Thursday 28th June 2018 at CCC. The meeting started with outstanding items from the previous meeting that needed to be updated or discussed further. Ex-CCC president Dayu Huang reported events held recently and some items concerning the CCC finance. Xufeng Sun, the Chinese School Council Chair, motioned to approve the “School Investment Policy”, which had been deliberated in the last two board meetings. The School Investment Policy aims to invest some school fund in a conservative and balanced allocation to keep up inflation in the next seven years. The investment policy was unanimously approved. Building Manager Mary Chen of FDMC reported building revenue and expenses. Controller Zhengyu Pang gave some suggestions to CCC accounts as well as the “CCC Investment Policy” and went over major issues we had encountered during the past year and would discuss them with newly elected treasurer Le Zhang to avoid potential issues in the future. After that, Lee-Hua Miaw motioned to vote on CCC Distinguished Service Award candidates Dayu Huang and Xufeng Sun. Both candidates were approved. The meeting also finished the handover ceremony of the ex- and the new President and board members at CCC. Our new CCC President is Yan Wang. New board members are Lee-Hua Miaw, Zhengyu Pang, Jian Xu, Wang Zheng, Haiting Wang, Dan Wu, Li Zhang, Daisy Lin, Yang Wang, Xiaoqing Zhang, Ling Bi, Xiaolan Rong, Le Zhang, Yue Lei, Yimeng Yin ( as an Executive Team staff), Xufeng Sun, Jie Wang, Peng Chen, Luna Zhang, Dawei Liu, Zhanpan Zhang, Mary Chen and Pengbo Sun (as a FDMC staff). The Ex-CCC president Dayu Huang officially handed over the Seal of CCC to the new CCC president Yan Wang. Yan and her new executive team members gave brief self-introduction and were welcomed by all attendees. The 2018-2019 board members also elected Lee-hua Miaw as the board chair and Zhengyu Pang as the vice board chair for the current term which starts on July 1st, 2018. At the end of the meeting, we formed executive committee, education committee, FDMC, finance committee, audit committee, Bylaws amendment/revision committee, nomination committee and fundraising committee. Finally, Yue Lei was appointed as the CCC Database Director to be in charge of CCC database. The meeting officially ended at a very positive note. On Feb 4, more than 800 people from the community and those who are interested in Chinese Culture gathered at the Hart Theater at The Egg to celebrate the Chinese New Year. The event "Amazing China: New Spectacular" featured Peking Opera, Chinese vocal, lute solo, Mezzo- Soprano Solo, flute Solo, Chinese martial arts, chorus and dance, performed by professional performers from the National Academy of Chinese Theater Arts, Confucius Institute of Chinese Opera at Binghamton University, and performers from the local Chinese community. 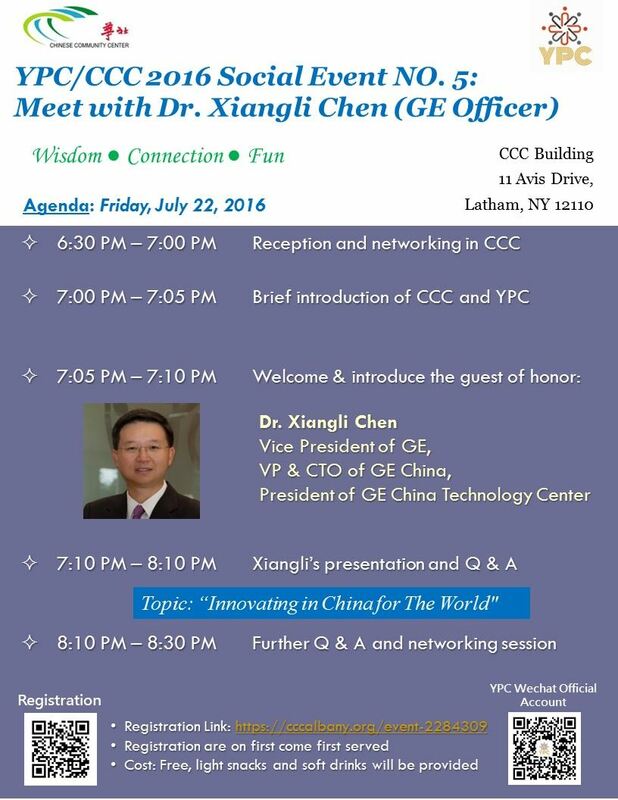 The event is organized by the Confucius Institute for China's Culture and the Economy of University at Albany and the Chinese Community Center of Capital District of New York, with General Electric as the main sponsor. Chinese School Open House and Registration - CCC Building, August 28 1-3pm.